The third novel in the thrilling historical trilogy about the rise and fall of the powerful and mysterious Templars, from the author of the immensely popular Camulod Chronicles. 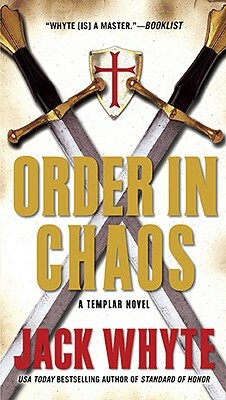 Order in Chaos begins just prior to Friday the thirteenth of October 1307, the original Day of Infamy that marked the abrupt end of the Order of the Templars. On that day, without warning, King Philip IV sent his armies to arrest every Templar in France in a single morning. Then, with the aid of Pope Clement V, he seized all the Temple assets and set the Holy Inquisition against the Order. Forewarned at the last minute by the Grand Master himself, who has discovered the king's plot too late to thwart it, Sir William St. Clair flees France with the Temple's legendary treasure, taking with him several hundred knights, along with the Scots-born widow of a French Baron, the Lady Jessica Randolph. As time passes and the evidence of the French King's treachery becomes incontestable, St. Clair finds himself increasingly disillusioned and decides, on behalf of his Order, to abandon the past. He releases his men from their "sacred" vows of papal obedience and leads them into battle as Temple Knights one last time, in support of King Robert Bruce at the battle of Bannockburn. And in the aftermath of victory, he takes his surviving men away in search of another legend: the fabled land, mentioned in Templar lore, that lies beyond the Western Ocean and is known as Merica.